Now that the longest day has passed, it is officially summer! Bring it on we say. We can’t get enough of the long Shetland days and all the freedom and opportunities that the extra light bring. Until around mid-July we’ll enjoy the ‘simmer dim’ (summer twilight) when the sun only disappears for a few hours, bringing us almost 19 hours of sunshine. 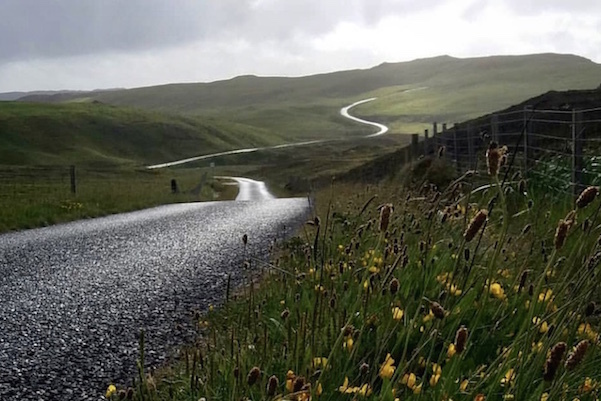 Those extra hours of daylight signal a season of opportunity and seemingly limitless options – whether that means exploring Shetland’s great outdoors; grabbing the chance to do more with family and friends; or to relish the time to consider and pursue new creative projects. Last month saw the launch of the SWW 2018 programme. We had a really encouraging response and a lot of events are fully booked. However, there is still a good selection left, and we’ve listed them all at the end of this newsletter. We’re adding the following classes to the programme. Tickets for these classes will go on sale Thursday 12 July at 14.00 BST via the SWW Little Box Office. Another chance to try visiting tutor Beth Brown Reinsel’s popular Gansey class.Students will learn how to construct a gansey, a sweater form prevalent in the 19th century and early part of the 20th century among the fishermen of the British Isles. This two-hour class by Janette Budge is aimed at beginner knitters who are new to Fair Isle or stranded knitting. It will cover how to knit with two colours in the round. The class is open to all ages. Join Jeannie and Janette and make your own Fair Isle-style pouch. An opportunity to practise blending, try a knitting belt and knit with two colours. This class is aimed at the intermediate knitter. We’ve added two more times to this sell out tour. Join local crofter Chris Dyer on an exclusive walk through the agricultural year on the isle of Bressay, looking at the sheep – ewes, rams and lambs. Join Andrea Williamson in her Whalsay studio for this creative taster to machine knitting, focusing on Fair Isle. 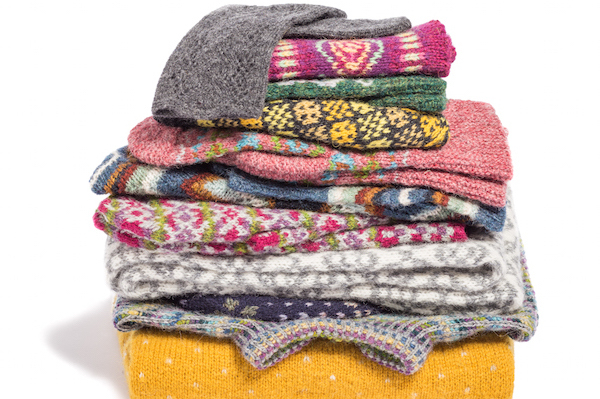 In this class you’ll be guided by tutor Terri Malcolmson on how the combination of colours and motifs can be used to create the desired effect in your Fair Isle knitting. Learn the basics of 2-colour brioche in the round by beginning a lovely, reversible cowl. The annual will be available to pre-order from early September. Details will be announced in future newsletters and through social media. It seems to be the season of the summer sales, so we thought we’d do our bit too. We’re delighted to be able to reduce the price of the exclusive SWW t-shirt and notepads form 2016/17. We were thrilled to see Rhea Kay, talented fourth year graduate in BA (hons) Contemporary Textiles at the Shetland College UHI named as the very worthy winner of this year’s Shetland Wool Week Prize. Her work was on display at the college this month, together with Megan Smith’s woven project. 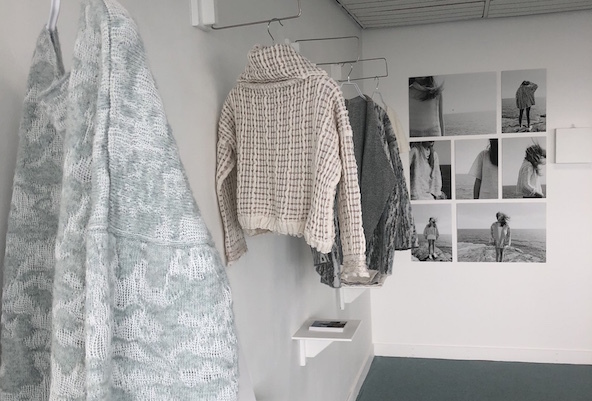 Both students have really pushed the boundaries of what textiles are by incorporating elements, such as sound, installation, fashion and photography to an exhibition standard. Rhea Kay’s ‘Coastal Cool’ used the Shetlandic coast as its central focus and the project was inspired by elements such as the patterns and structures found in sea foam and shells. It also gave a nod to Shetland’s links with Scandinavia and prioritised elements such as simplicity, minimalism and light. Her work is truly beautiful and we think Rhea’s name is one that we will definitely be hearing more of in the future. We’re delighted that we’ll be able to share Rhea’s work with you as it will be on display at the ‘Kaleidoscope’ exhibition, which will take place at the SWW Hub in the Shetland Museum and Archives, as part of a wider exhibition to celebrate the Year of Young People. Many of you will know Anne Eunson from her fabulous lace knitting classes, or perhaps, more recently from visiting or seeing photos of her ingenious knitted Shetland lace fences, one of which is currently on display at the Shetland Textile Museum. Anne has lived in Shetland all her life. Originally from Voe, she now lives in Burra. She has a daughter and son, and three grandbairns. She’s an extremely busy lady, and has had a varied working career: her first job on leaving school was at T M Adie & Sons in Voe, working on a knitting machine. She then spent seven years as auxiliary nurse at Maternity annexe before having her own children. This was followed by 16 years at Lerwick Pre-School, where many parents and carers would vouch for her most wonderful knack of eking out and encouraging creative talent in the very young. We caught up with her to find out more..
Knitting to me is a bit like breathing. I’ve been doing it all my life, I think I was born with knitting needles in my hands. I need to know I have something on “da wires” that I can pick up when I sit down otherwise I would become agitated. Maybe I’ve got an addiction? Where and when do you usually knit? 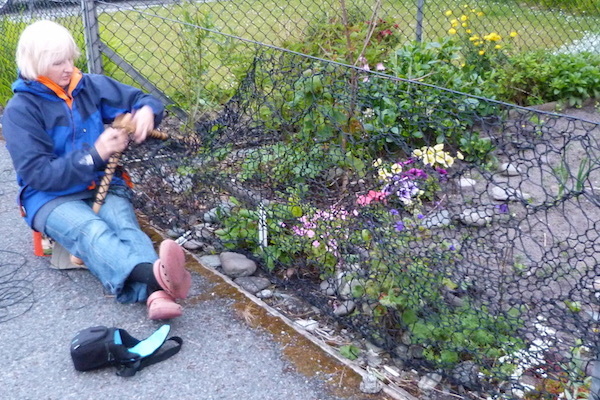 I usually take my knitting with me wherever I go, so I’ll knit anywhere and at any time. It’s a big struggle for me to sit “haand idle”. I do enjoy going to my favourite cafe and do some knitting while I have a coffee. The only place I won’t take my knitting to is the church. How does your perfect day shape up? My perfect day would be getting up early on a sunny summer’s day and potter about in my garden while I listen to the dawn chorus and the rest of the world slowly come to life. 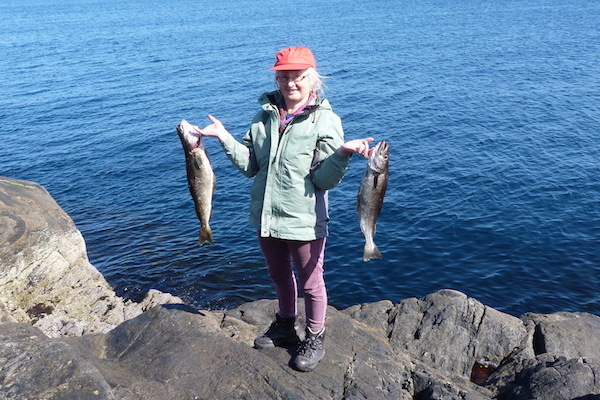 Then I’d like to spend a few hours at “da Craigs” (sea fishing from the rocks) and hopefully catch some fish for tea. In the afternoon I’d find a sheltered spot in the garden where I can sit and knit, then invite some friends/family round for tea. The evening would be spent playing music with a few of my musician friends. I have a wedding to go to in a few weeks’ time so I’m in the process of knitting a lace stole to wear for the occasion. I always have a pair of socks on the go too, that’s my emergency/take anywhere knitting, which I can stuff in my handbag if necessary. What’s been your most challenging knitwear project to date? A few years back I needed to replace the fence around my front garden and I was trying to think of how I could do this myself with materials that weren’t going to cost a lot of money. The existing fence had angle iron uprights plus a top and bottom wire and I realised that would be the perfect support for a piece of lace knitting. One of my favourite Shetland lace patterns is “Da Print and Da Wave” and I thought that could look good just running along the fence. But what yarn could I find that was going to stand up to the elements here in Shetland? I decided to visit the local net mending store and see what they used for fishing nets. I came home laden with a few kilo of black polypropylene twine eager to get started but I didn’t have any big knitting needles. I mentioned to my Mr Fix Anything friend what I was planning to do and, low and behold, a few days later he appeared with a beautiful pair of needles he had crafted from an old wooden curtain pole. Once I got started it only took about three weeks to complete, but it was not an easy knit, mainly because of the difficulty in seeing the pattern in the knitted twine. It’s been in situ for six years and standing up well. In the knitting world it is the very fine handspun Unst lace that inspires me. I never get fed up seeing it and it never fails to amaze me that such intricate patterns can be achieved by just a few simple stitches. How did they have the patience to spin all that fine 2ply yarn? Although I don’t do a lot of colour work myself I do like colour. One person I admire greatly for her use of colour is Wilma Malcolmson: she just gets colours to work. Do you get involved in local events or community groups? I’m volunteer lead tutor for ShetlandPeerieMaakers at my local school, teaching primary bairns the Shetland way of knitting. I like to help at charity fundraising events my local church organises and the Soccer School they run each summer. 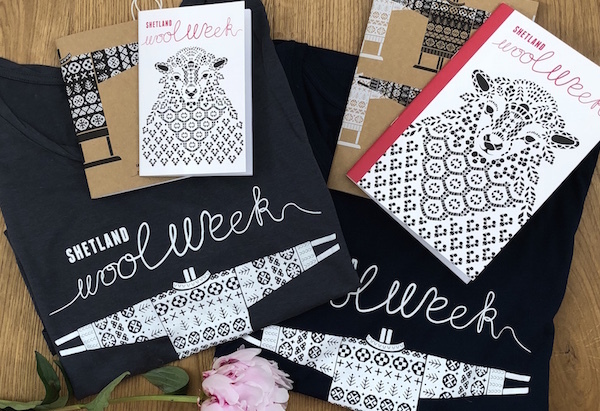 The biggest event I get involved with each year is Shetland Wool Week. This year I’ll be teaching six different classes all relating to lace, three of these will be with my sister Kathleen Anderson. I do enjoy the teaching aspect and meeting likeminded folk from all ends of the earth. It is a brilliant week. Favourite Shetland dialect word and why? Some Shetland words are just so descriptive that there is no substitute in the English language. Spaegie has to be a favourite, it’s that ache you get in your muscles from overdoing things the day before. I suffered fae Spaegie in me airms and shooders whan I wis knitting me fence. What’s your favourite thing about Shetland? I have so many favourite things about Shetland it’s impossible to pick only one. There’s the ever changing sea, wild flowers, long summer days, tattie soup and Reestit mutton, saat fish, bannocks and rhubarb jam and then there’s the folk who live here, too. It’s great to live in a community where you know your neighbours will be only too willing to help you should the need arise; that’s especially reassuring for anyone living on their own. Oh, and I almost forgot, the music scene here is pretty special too, the talent in the young school bairns takes my breath away.